After watching the cardboard animation by Sjors Vervoort I did some searching and came up with some other cool animations along the same lines. 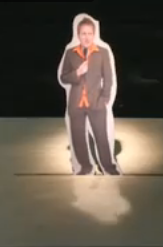 Roger Wieland has several cardboard animations available online. The first one is called "The Stand Up Comedian". Take a look at his YouTube Channel for lots of examples of his work including the second one below, a great music video: Whatcha Got.